HALAL Shampoo Plus Conditioner 2 in 1 with Honey, Black Seed, and Quinoa protein. This Halal Shampoo Plus Conditioner 2 in 1 serves for all Type of hairs. 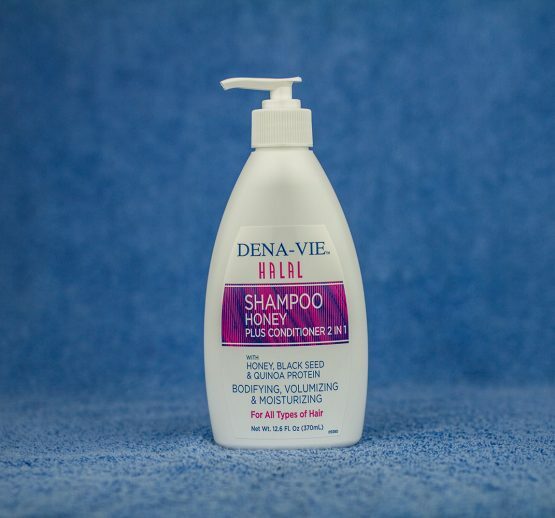 Provides a good body, volume and moisturizing effect to your hairs, so you can feel comfort and softness in your hairs. The Honey (know more) help regulates and retains moisture in the hair, plus honey is said to strengthen hair follicles for healthy growth. Its aroma will reflect a very pleasant and relaxing sensation to you and the one around you. The Black Seed oil will provide you with a layer of protection and create the needed body of the hair and root. The Quinoa Protein (know more) offers a unique chain of amino acids within the plants’ category. It has a surprising amount of 6 essential amino acids, such as Cysteine, Cystine, Lysine, Methionine, Tryptophane, and Tyrosin. These amino acids enhance the repair, protection, and conditioning of both hair and skin. The Quinoa Protein protects the hair from the outside environmental stress and retains the moisture in your hair.